Enjoy your favorite movies for more than just 2 hours. IN ASSOCIATION WITH: Amazon, Ebay, Zazzle, AllPosters, CafePress. All transactions are safe and secure with a reliable history in online purchasing behind each of our associates. Buy the Freddy Krueger Nursery Rhyme t-shirt to own Nightmare on Elm Street clothing and merchandise. One two Freddy's coming for you, three four better lock your door, five six grab your crucifix, seven eight better stay up late, nine ten never sleep again. This design celebrates the Krueger nursery rhyme that has become synonymous with the horror movie, but be careful, it might make you sleepy. This Freddy t-shirt displays the notoriously creepy rhyme in lettering similar to the Nightmare on Elm Street movie font. Complement your collection with this killer A Nightmare on Elm Street nursery rhyme t-shirt, or quote its lyrics in the movie sweater. Click the "BUY" button to select t-shirt size and to see seller's price. 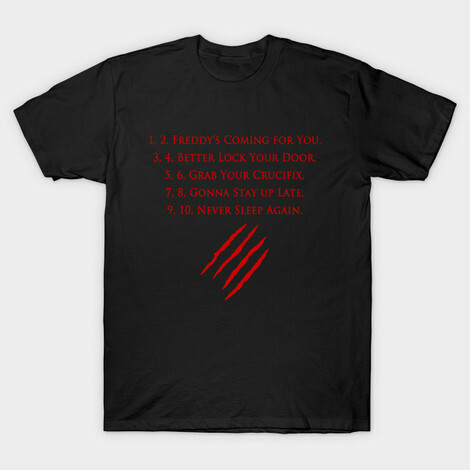 In addition to the Freddy Krueger Nursery Rhyme tee above, browse the Nightmare on Elm Street Clothing Gallery for more apparel like men's and women's clothes, kids shirts or hoodies.